Integrity, sustainability and an earth friendly focus are the stated goals of Emiliana, the winery producing this organic wine. 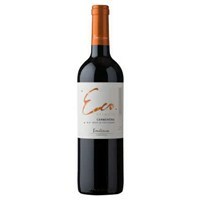 Eco is a blend of 85% Carmenere, 15% Cabernet Sauvignon. Intense ruby-red in color, with a wide variety of aromas of strawberries, cherries, and black pepper with a touch of coffee and smoke from the oak. The smooth palate shows medium concentration and elegant, velvety tannins that result in a pleasing, well-balanced wine with a persistent finish. I thought you would be interested in this product I found on the Liquor Plus website. Copyright © 2010 Liquor Plus. All rights reserved.